Published in the South Kent Gazette, 19 March, 1980. Archcliffe Road is the approach to places of interest and importance on the western outskirts of Dover. On the right there are two roads, which lead up to the Western Heights and the Citadel. The first passes the site of the old Military Hospital, now demolished, in a sunny hollow of the foot hill. Close to the south side of this Hospital was a graveyard, which was used as late as the 19th Century, but this place has been called “The Graves“ since 1666, when the plague visited Dover, and between four and five hundred of its victims were interred at this spot. The ground may have been earlier attached to the Chapel of Our Lady of Pity, which stood below Archcliffe Point until 1576. Adjoining Archcliffe Fort, on the edge of the cliff, was the piece of ground where the old Cinque Ports Volunteer Artillery, the predecessors of the local Territorial Artillery, had their big gun practice for many years, and it was at this spot, in August, 1860, that Lieutenant G. T. Thompson (who was also Register of the Harbour Board and Coroner) and Sergeant Monger lost their lives by the bursting of a gun. This was an accident without parallel. The Coroner and his fellow victim were lying dead, and there was no one qualified to hold an inquest. An application was made to the Lord Chief Justice, the chief coroner of the Realm, to appoint someone to act in the emergency, but he replied that the only authority having power to appoint a coroner for Dover and its Liberties was Dover Town Council and that they should meet as soon as possible to do just that. Further on, along the cliff edge, was the South Lines Battery, and on the other side of the road buildings were erected in 1859 for the stores and Headquarters Staff of the Kent Artillery Militia, a unit that was formed during the Crimean War, with headquarters at Dover Castle, and which existed till the creation of the Territorial Army in 1S08. Nearby there were also the Provost Prison and the Army Service Corps stables. Further on, towards Shakespeare Cliff, the Dover Council built the Ropewalk housing estate of 100 cottages between 1923-24. The site is partly on the Ropewalk Meadow, so-called because the business of rope-making was carried on there after the ropewalk was displaced under the cliff by the South-Eastern Railway. After the rope-making ceased to be a Dover industry, the land was put to various uses. At critical periods, military camps have been formed on this spot, and a portion of the area remains the property of the War Office. At one time part of it was known as the Pier Recreation Ground — Dover’s first public football ground. Further on the Royal Naval Shore Signal Station, formerly called Townsend Coastguard Station. On the land side of this wide cliff-top area runs the ridge of the Western Heights. Here there was a Naval Wireless Station in the early days of wireless for communication with Portland and Sheerness. On the Western Heights overlooking this area were also placed, soon after 1900, two powerful modem batteries, with guns to command the Straits of Dover. Bulwark Street, facing the railway goods sidings that replaced the east side of the street, formerly completed the direct route from Snargate Street to the South-Eastern Railway “Town“ Station. It now ends with the fence of the railway and by the late 1970s had been reduced to only three houses, Nos. 57, 58 and 59. Bulwark Street derived its name from the circumstance that at the seaward end of it stood a tower, or bulwark frequently mentioned in local records, which was built by Sir John Clark to guard Paradise Harbour. There are references to fortifications which stood near this spot, severally called the Black Bulwark, the Green Bulwark, the Barley Bulwark, and the Bulwark under the cliff. The Black Bulwark is generally supposed to have been nearer the original harbour entrance, and most probably the other bulwark mentioned as the one “under the cliff“ was the defensive work which stood at the seaward end of Bulwark Street, in the vanished Great Street, armed with the primitive ordnance of the period, to protect the shipping lying in Paradise Harbour. At that time, in the reign of Henry VII., the site of Bulwark Street was a fringe of shingle between the Harbour and Archcliffe, and so it remained until near the end of the 18th Century. The making of the turnpike road to Folkestone, by Limekiln Street and Bulwark Hill, brought this waste into the market as building land. By that time, the void space had been greatly extended by the silting up of the old Paradise Pent, which had become a swamp, covered with reeds and fushes. The building of Bulwark Street commenced about the year 1800. Few of the houses there are as old as that. 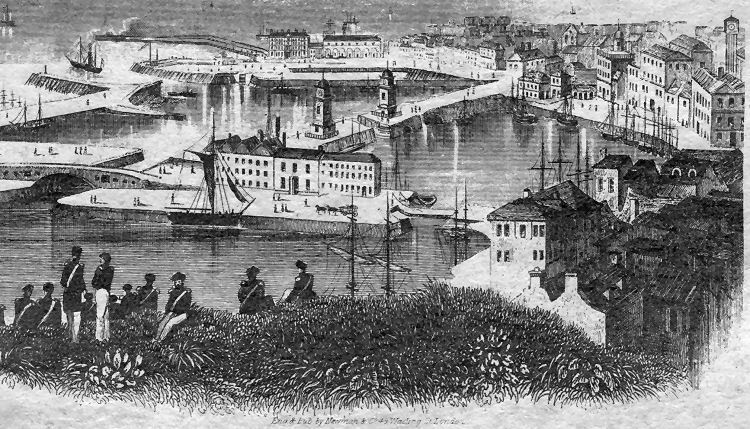 An attractive engraving of the mid-19th century showing the view of the western docks area seen by Volunteers and other soldiers from the garrisoned cliff-tops above Snargate Street. In the foreground is the Wellington Dock and Union Quay. Particularly interesting Is the fact that the drawing depicts two entrances into the Wellington Dock. One Is from the tidal harbour on the left which, in widened form, still exists, and the other leads into Granville Dock on the right. Behind George Hammond’s old warehouses on Union Quay are the clock towers on the Crosswall and, on the extreme right. Is the taller clock tower of the old harbour station. Beyond the Crosswall is the Lord Warden Hotel and the old town station adjoining which was demolished In recent times. The other picture, below, shows the two railway tunnels through the foundations of the old Archcliffe Fort and the work going on to demolish the fortification in connection with railway improvements. Rubble was tipped down shutes Into railway wagons and used to fill In the space below the trestle-mounted railway line running along the top of Shakespeare Beach.